Sherlock Holmes (1916) Could Be Yours! One lucky winner will receive Sherlock Holmes on Blu-ray/DVD! Subscribe to the Flicker Alley newsletter below for a chance to win. 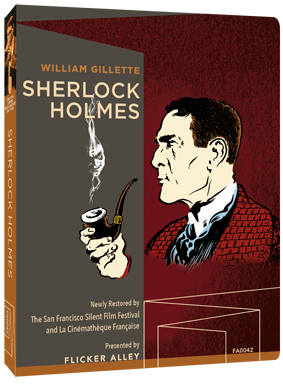 Gillette's sole filmed performance as Sherlock Holmes, considered lost for nearly 100 years, has been recently discovered and brilliantly restored by San Francisco Silent Film Festival and la Cinémathèque française. And now it can be yours! We're giving away a copy of Sherlock Holmes (1916) to celebrate the conclusion of this 100-year-old case. Sherlock Holmes premieres on Blu-ray/DVD from Flicker Alley October 20. Pre-orders are now available.